This 200ml stainless steel hip flask is a great gift idea for the AC/DC fan. This official licensed product is intended for purchase & enjoyment by people of legal purchase age for alcoholic beverages. Drink responsibly. AC/DC formed in Sydney in 1973 by rhythm guitarist Malcom Young & his brother, lead guitarist Angus Young. The band has sold over 150 million albums worldwide, making them one of the most successful hard rock acts ever. Their 1980 album Back in Black has sold more than 42 million units worldwide (21 million in the US alone) & is the second highest selling album of all time. The band has had two distinctive lead singers, & its fans tend to divide its history into the "Bon Scott era" (1974-80), & the "Brian Johnson era" (1980-present). 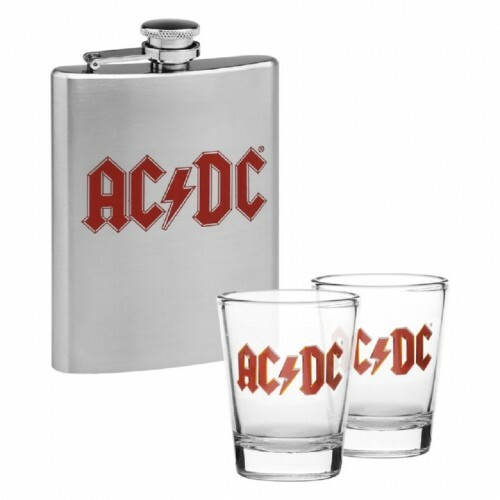 This 200ml stainless steel hip flask is a great gift idea for the AC/DC fan. This official licensed product is intended for purchase & enjoyment by people of legal purchase age for alcoholic beverages. Drink responsibly. AC/DC formed in Sydney in 1973 by rhythm guitarist Malcom Young & his brother, lead guitarist Angus Young. The band has sold over 150 million albums worldwide, making them one of the most successful hard rock acts ever. Their 1980 album Back in Black has sold more than 42 million units worldwide (21 million in the US alone) & is the second highest selling album of all time. The band has had two distinctive lead singers, & its fans tend to divide its history into the "Bon Scott era" (1974-80), & the "Brian Johnson era" (1980-present).